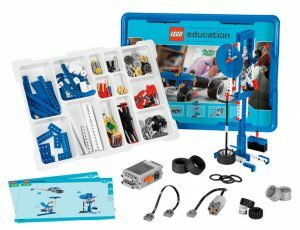 What happens when you pair LEGO Education’s Simple & Powered Machines set with a pocket-sized all-in-one set of sensors? 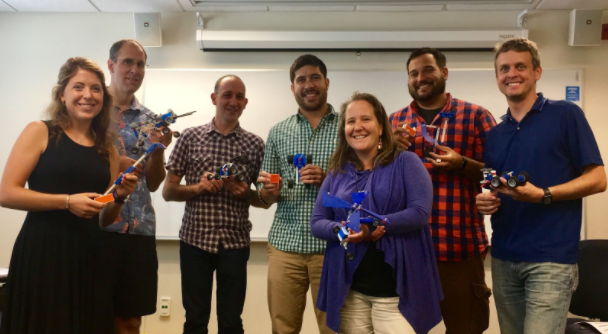 This summer, Tufts Center for Engineering Education and Outreach hosted a group of science and technology teachers to experiment with LEGO Education sets and PocketLab, a small, handheld device that includes an accelerometer, a gyroscope, a magnetometer, a barometer, and temperature sensor. We hope to share some of the unique ways they leveraged the combination of the two in ways that could enhance a variety of hands-on STEM lessons, particularly those surrounding forces, motion, and mechanics. PocketLab One. This original model was designed for exploring the physical sciences and engineering across all ages. PocketLab Weather. This more rugged, weatherproof model houses sensors more specific to understanding concepts in weather and climate, including dew point, heat index, temperature, light, and humidity. PocketLab Voyager. This model combines the capabilities of both the original model and PocketLab Weather, with the addition of a range finder. 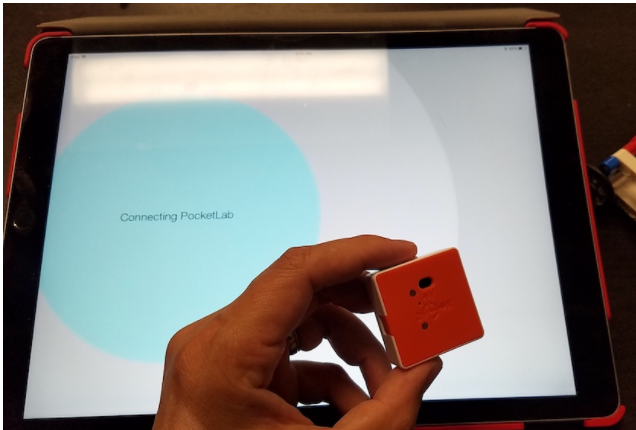 PocketLab connects to the PocketLab App and the Velocity App so that users can view sensor readings in real time and export the data if desired. Everyone found value in spending time to explore the PocketLab on its own and becoming familiar with its iPad app before diving into the activities. After turning the PocketLab on and waiting for the LED to blink, which indicates that the device is in BLE pairing mode, it will then connect to the PocketLab application, also indicated by a color change (both on the PocketLab and the application itself). 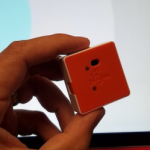 Once paired, the application immediately starts displaying a graph of data streaming live from the PocketLab, with the option to toggle between different sensor readings and also the option to view a live video stream alongside the data. 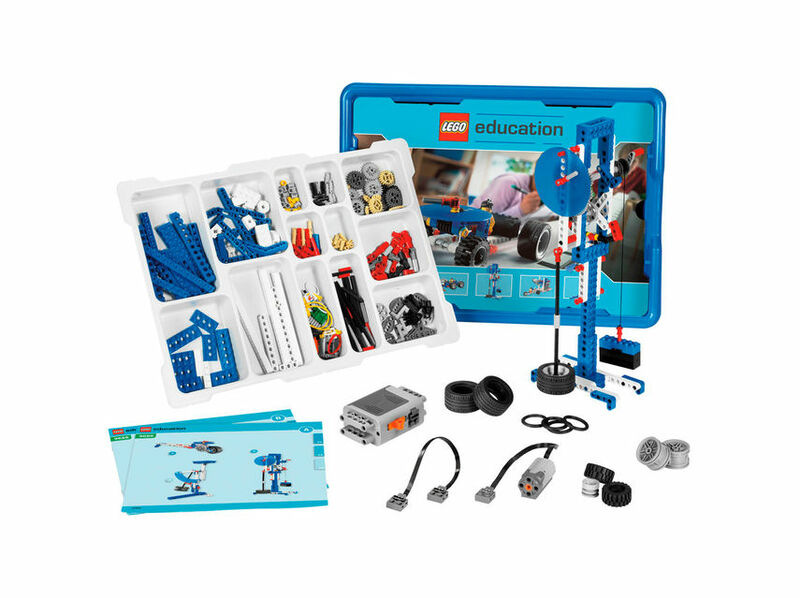 The LEGO Education Simple & Powered Machines set (9686) contains an assortment of bricks, wheels, and other pieces that can be used to create 28 models, all of which demonstrate various concepts in mechanics and structures. 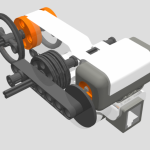 The set, however, does not include sensors as can be found in the EV3 set. 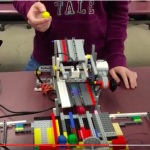 During two days of experimentation with the LEGO set and the PocketLab sensor, we considered how the use of sensors could enhance the educational capacity of the Simple & Powered Machines set. Might we attribute any of the noise in the data readings to where on the model it was attached? One of the great things about using the LEGO models that come with build instructions is that student groups can all start with the same baseline. The dimension of taping on third-party hardware brings a risk for less consistency across groups. This, however, can also be seen as an opportunity for classroom discussion to address measurement noise and inconsistent readings. Does the tape block or alter any of the sensors? What are some alternatives to tape that won’t damage the sensor or LEGO? One teacher, for instance, 3D printed his own case for the PocketLab that contained holes matching the size of LEGO technic pegs (see his model on Thingiverse here). 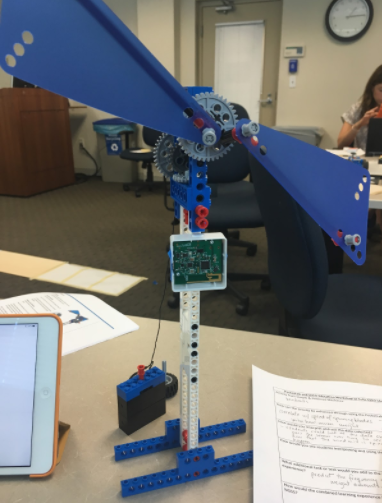 We spent two days experimenting with a variety of the 28 prescribed LEGO Education models, with a focus on the Windmill, the Hammer, the Clock, and the various vehicle models. Some of their findings and suggestions for other educators are highlighted below. 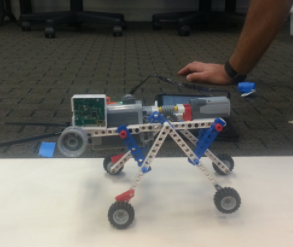 One teacher was immediately drawn to the LEGO Education Walker model, which is used to demonstrate the motion of a walking insect. At first, the sensor was attached towards the back of the model near the motor, which generated a substantial noise in the position data. The teacher was determined to leverage the PocketLab to demonstrate the cyclical motion of the insect’s gait and use the data as a starting point for discussion about frequency and periods. Moving the PocketLab towards the front of the insect yielded cleaner data and minimized noise from the motors placed in the back. The greatest pairings, teachers generally agreed, were the combination of PocketLab with the vehicle models. “Understanding the relationships between position, velocity, and acceleration can be difficult for a middle school student to grasp,” one teacher reflected. “The chance for a student to visualize those relationships all on the same video stream and relate it back to the LEGO model they built is a huge learning opportunity.” Not surprisingly, the teachers found that attaching PocketLab to the vehicle models (Dragster, Land Yacht, Fly Wheeler, and Free Wheeling) were the best models for capturing position, speed, and acceleration data. 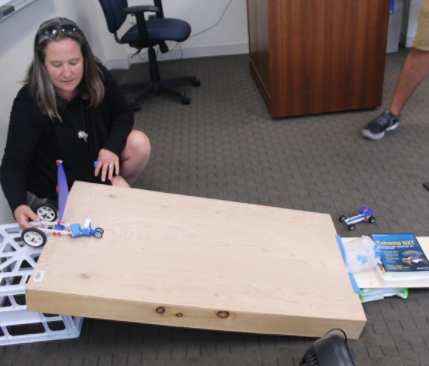 Teachers took it a step further and asked, “How can we leverage all of these sensors to demonstrate measurements of force and impact?” Force and impact are commonly occurring themes across the Simple Machines kits, particularly the Hammer model and those involving vehicles. Although there is currently no sensor within PocketLab that directly measures force, two of the teachers saw this as an opportunity to get creative in designing their own crash pad for testing impact. They put the PocketLab sensor inside of a sealed plastic bag and watched how the barometric pressure changed as the Dragster sped down the ramp and compared across different ramp angles and different design tweaks. In relation to renewable energy and environmental awareness, the windmill model can provide a neat opportunity for students to consider energy efficiency and design optimization. With help from the PocketLab readings, students can analyze the motion and speed of the windmill with different numbers of blades and different positioning. To further extend the activity and leverage student creativity, students could also design their own windmill blades of different materials. A tip from the teachers: it is helpful to have another Pocketlab or other object of equal dimensions to act as a counterbalance. 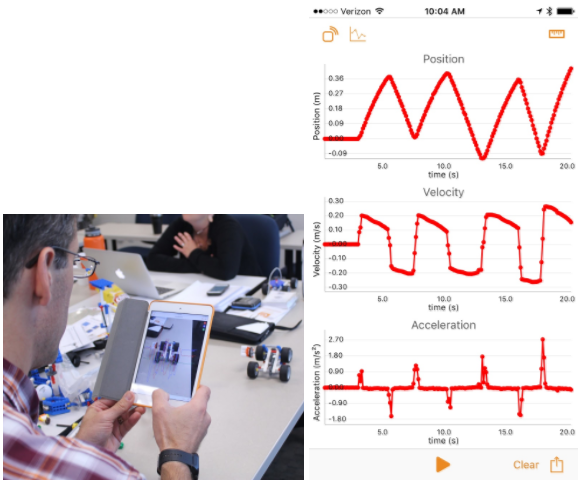 While younger students could benefit from exposure to these concepts, older students in middle school or high school physics classes could leverage the PocketLab app to not only to visualize the data trends, but also to capture, analyze, and share it. The quicker means of data collection through PocketLab, one teacher suggested, could allow for more class time to be spent on design iterations, data analysis, and discussion. Teachers reported after their exploration that the PocketLab broadened the scope of how the kits could be used in the classroom; the pairing of the two provided opportunities for students to test, redesign, and draw conclusions based on real data. For further resources and updates, be sure to check out the PocketLab’s community site and LEGO Education’s curriculum resources. 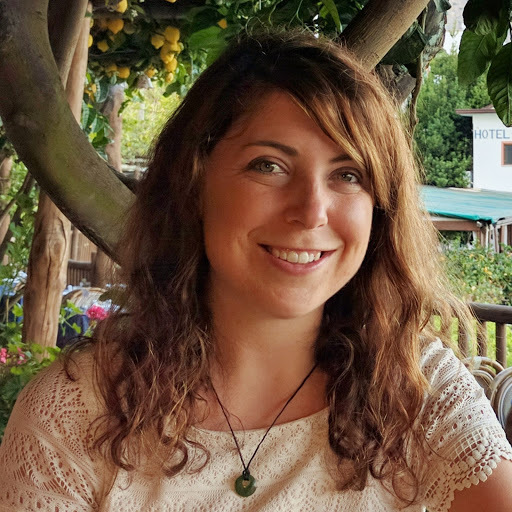 Susan received her masters in mechanical engineering at Tufts University in 2016 while researching at Tufts Center for Engineering Education and Outreach. She continues to work as a Project Coordinator at Tufts CEEO where she helps run student workshops and educator professional developments.